1. 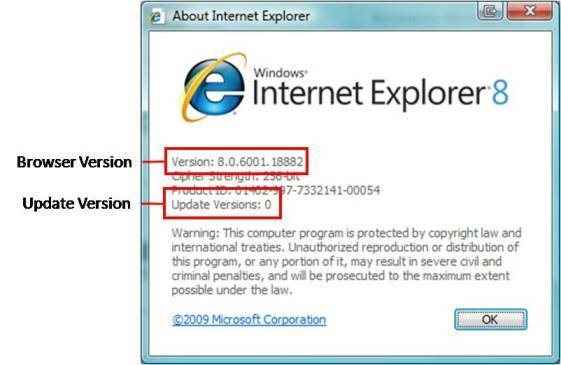 Users are using Microsoft's Internet Explorer (IE) web browser. This application comes with all versions of the Windows operating system. You cannot use other browsers including (but not limited to): Mozilla Firefox, Google Chrome, and Apple Safari. 2. Inspect the Browser to ensure that standard menus and navigational toolbars appear correctly. · The toolbar across the top of the user’s screen should contain the following main options: File, Edit, View, Favorites, Tools, and Help. · The standard buttons should include: Back, Forward, Stop, Refresh, Home, etc. · The user has the Address bar. · The user has limited extra buttons and links. An efficient Internet navigation toolbar may include a search bar such as Google or Yahoo! but often extra buttons and search bars reduce speed and cause conflicts with navigation settings. · Go to Help > About Internet Explorer on the top menu bar of the browser. · A pop up window will then appear with information pertaining to the version of Internet Explorer that the user is currently using. In this window, find Version and check that the version is at least 6.0 and that Update Versions is SP1, SP2 or greater (users with version 8.0 may not have an Update Version listed). · Under the Browsing History section, click the Delete button. Check the boxes next to Preserve Favorites website data, Temporary Internet Files, and Cookies. Then click the Delete button. Note that this may take a few moments and an hourglass may appear if these actions have not been completed recently. 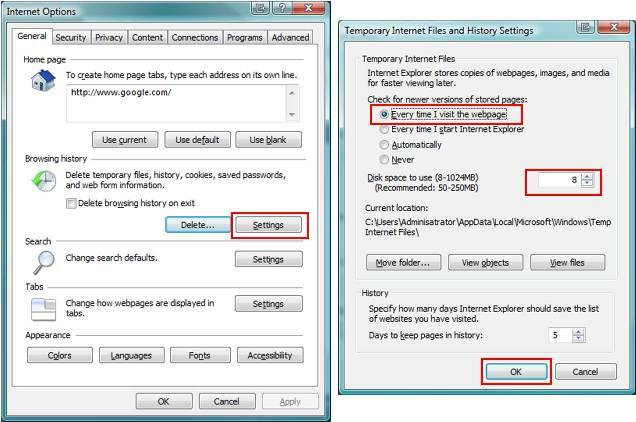 · Under the Browsing History section, click the Settings button. · At the bottom-right of the window, click the Reset all zones to default level. 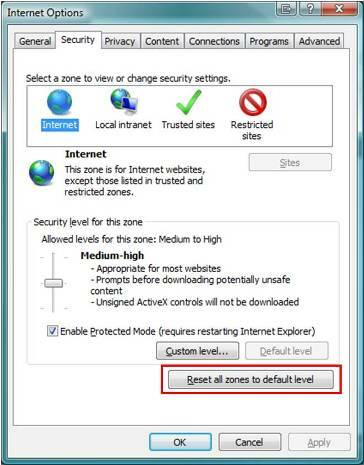 Note: Users with Version 6.0 will need to click on each content zone (there are four total) under Select a Web content zone to specify its security settings, and then click the Default Level button under Security level for this zone for each zone selected. · Under Add this Web site to the zone type *.virtualgoalcoach.net Note that the “*” symbol can be made by holding the Shift key and pressing the 8 key. 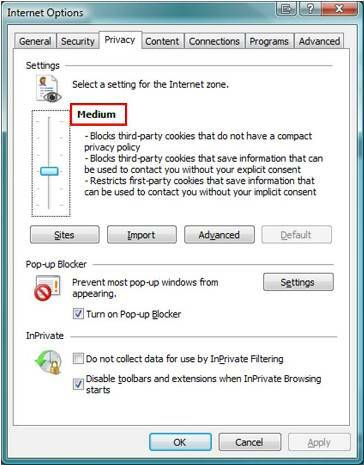 · Click on the slider under Select a setting for the Internet zone and move the slider towards the center to select Medium for your privacy setting (note that "Medium" may already be your setting). f. Auto Complete has been disabled (Having the username/password information automatically entered compromises the security of the system). · Under AutoComplete , click the Settings button. 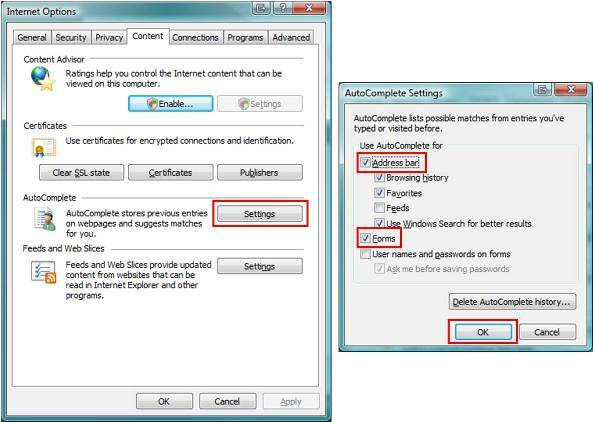 · In the AutoComplete Settings window, under Use Auto Complete for, uncheck the User names and passwords on forms check box (Address bar, Forms and any of their sub-selections can be checked). Virtual Goal Coach (VGC) is an online tool, which provides you internet links to resources that can help you achieve your Employment, Financial, Education and Homeownership goals. The first step is to navigate to www.virtualgoalcoach.net where you'll discover additional information about the VGC as well as the remainder of the functionality discussed in this training manual. Once on this page, you will find a left-hand menu with additional information about the VGC as well as the Login functionality (discussed in Section 1.5). The next few sections of this manual expand upon these left-hand menu items. The Tutorial section offers step-by-step instructions on the different parts of the system. Use these as guidelines to get started on reaching your goals. FAQs (or "Frequently Asked Questions") is a link you can click on to find answers to some of the most common questions a VGC user might run into including how to login and what to do if you've forgotten your password. Contact Us provides you with the means to get a hold of help if the Tutorial or FAQs have not given you the information you need to proceed. Clicking the Contact Us link will provide you with a name and/or phone number of someone who can offer assistance on any of your VGC questions. Navigating to www.virtualgoalcoach.net will bring you directly to the Login page. Another way to reach the Login page from anywhere in the system is to click the word "Login" found at the top-right of the screen at all times when inside the VGC. 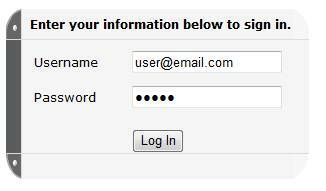 After clicking the Login icon on the top-right navigation area, you will be sent to the user's secure login page. You must be registered as a user (your coach will have sent you a Welcome email with your username and password) in order to login and use VGC. Once on the login page, you will be asked to input your unique username and password (which you should have received in your "Welcome" email from your coach). Note that your username is usually your email address and neither the username nor the password is case sensitive. In other words, inputting "User" is equivalent to typing "user". For security purposes, please make sure not to share your password with anyone else, as this is the only unique identifier of the person who logs into the system. Once you are done entering your username and password, you must click the Log In button to access the secure area of the system. This is accomplished by using a Secure Socket Layer (SSL), which is a protocol method of choice for securing data transmissions across the Internet. Whenever you see a "closed lock" in the activity bar of your browser, it means that a secure connection has been established and it is safe to send sensitive data through the Internet. Whenever using web-based systems that make use of the SSL protocol, you should not use the Back or Forward buttons for navigation, but instead rely on the navigation found within the system (links and buttons on the web page). In addition to using the SSL protocol, the VGC system makes use of a timeout feature. If you do not save a page or navigate to another page within 20 minutes, you will be logged out of the system and any partial data entered on a page will not have been saved. Once you have successfully logged in, you will be brought to the Personal Space section of the system which will be discussed further in Section 2 of this manual. Home: Clicking on the Virtual Goal Coach logo will take you to the Personal Space screen without logging you out of the system. Get Support: Click here to find contact information when you need technical help. Login/Logout: Clicking Login will take you to the login page where you can securely login to the Virtual Goal Coach system. Logout becomes visible once you are logged in and it securely logs you out of the system in one click. B. The left navigation menu is context sensitive and will change according to the task that is being performed. The Personal Space screen's left navigation menu options will be further discussed in Section 2. C. The top-navigation menu: Once you are logged into the system, this menu area links to the following tools of the system: Personal Space, Work on Goals, and Resource Directory. D. The body-navigation links: The links in this area give you access to specific files and tools within the task that is being performed. Acceptable Use Policy: Links directly to the User's agreement. Security Statement: Links directly to the Security Statement. Privacy Statement: Links directly to the Privacy Statement. FAQ's: Links to a Frequently Asked Questions document for users new to the Virtual Goal Coach system. Contact Us: Click on the Contact Us link to write an email message or call Virtual Goal Coach technical support. After logging into the system, you will now be able to begin working on your goals, contacting your coach, and preparing your vision statement. The Personal Space link is located on the top navigation menu that appears once you have logged into the system. The Personal Space section of the system gives a quick view of your messages, goal status, vision statement, and various options available in the left-navigation menu (reviewed in Sections 2.1 - 2.5 of this manual). "You have # unread messages" - this displays the number of messages sent to you that you have not yet read. Clicking on the blue text will take you to the Inbox of your Message Center (further discussed in Section 2.4). Vision Statement - this displays your vision statement. If you have not yet entered a vision statement, it will be blank. To enter or edit your vision statement, you will need to click Vision Statement from the left-navigation menu (further discussed in Section 2.2c). Now you are ready to start setting up your goals. The first link listed in the left-navigation menu of the Personal Space screen is Select Goals. Click on Select Goals link on the left navigation menu of Personal Space. You will see a list of pre-made goals that your coach has created. Some of them, your coach might have even pre-selected for you. 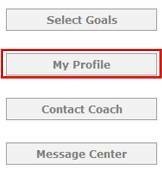 You may modify your coach's selections and even add your own personal goals. Selecting/Unselecting Goals: You may select additional goals by checking the checkbox for the goal you would like to add. Similarly, you may remove goals by unchecking the checkbox. 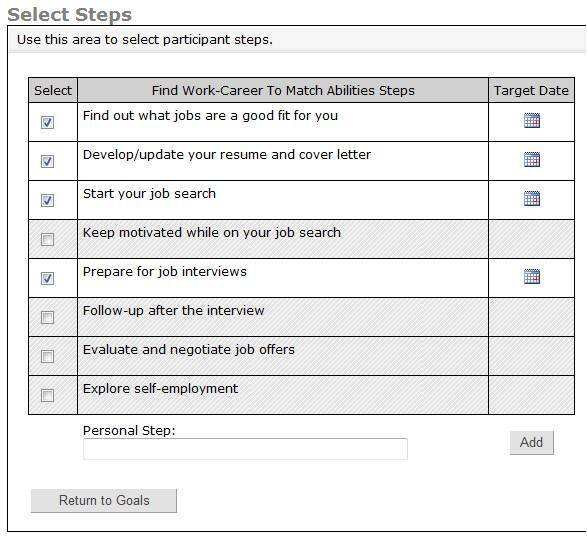 Goals with a checked checkbox and white background are considered "selected" while unchecked goals with a gray background are considered "unselected"
Adding a Personal Goal: You also have the option of creating your own Personal Goal. To do so, in the last row (labeled "Personal Goal"), give your new goal a name and click Add. After clicking Add, you will see your personal goal's name filled in and an empty place for "Goal Completion Prompt." In the "Goal Completion Prompt" field, fill in a question that you would like to be asked once you've completed all of the steps for your goal to know if completing all of the steps has allowed you to complete the goal, or whether the goal is still not completed even though all steps are complete. This goal will now appear in your list, but it will be unselected. You'll still need to select it as a goal that you'd like to work on by checking its checkbox in the list of goals. Editing a Personal Goal: If you ever need to make a change to your personal goal, at the end of its row in the list of goals, click on the Edit button. 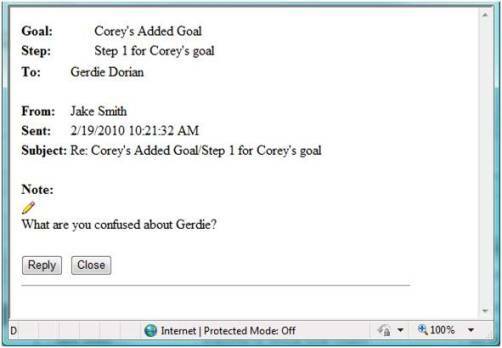 Doing so will allow you to change the goal's name, goal completion prompt, as well as deactivate the goal. Once you've made your changes, just click the Update button and they will be saved. If you decide you don't want to make the changes, just click Cancel. View Printable List: Clicking this link will provide you with a printer-friendly list of your goals and steps. It's located just below your list of goals. Once you've gotten your goals the way you desire them, you'll need to choose the steps to achieve these goals. You'll want to do this for each goal that's selected. Some of your goals may have pre-selected steps from your coach. To choose the steps for a particular goal, find the goal in the goal list and then click the Go button for that goal. You can do this for goals entered by your coach or for any personal goal you may have created. You will then be presented with a list of steps for the selected goal. Selecting/Unselecting Steps: You may select additional steps by checking the checkbox for the step you would like to add. Similarly, you may remove steps by un-checking the checkbox. Steps with a checked checkbox and white background are considered "selected" while unchecked steps with a gray background are considered "unselected"
Adding a Personal Step: You also have the option of creating your own Personal Step. This is done the same way for a goal created by your Coach or for a goal you created. To add a personal step, in the last row (labeled "Personal Step "), give your new step a name and click Add. After clicking Add, you will see your personal step's name filled into the "Step" field. If everything is correct, click Save or click Cancel if you do not wish to save the step. This step will now appear in your list, but it will be unselected. You'll still need to select it as a step that you'd like to work on by checking its checkbox in the list of steps. After selecting a step, you'll need to indicate the "Target Date." This is the date that you intend to have this step completed. Your coach may have selected some of these dates for you. To select the Target Date, click on the calendar icon at the end of the step's row. Select your step's target date by simply clicking on the date in the Calendar. The "<" and ">" buttons to the right and left of the month and year ("March 2010" in this image) allow you to change the Month of the calendar. The "<<" and ">>" buttons to the right and left of "Change Year" allow you to change the Year of the calendar. The number highlighted in bluish-gray is the current day. Clicking the Cancel button will not save your selection. To modify the Target Date, you just click on the calendar icon again and the calendar will be presented to you again. Editing a Personal Step: If you ever need to make a change to your personal step, next to the step's name, click on the Edit button. Doing so will allow you to change the step's name, as well as deactivate the step. Once you've made your changes, just click the Save button and they will be saved. If you decide you don't want to make the changes, just click Cancel. Click on My Profile link on the left navigation menu of Personal Space. You will be presented with the My Profile section of the system which contains: Update Profile, Change Password, and Vision Statement tabs. Use this functionality to update your phone number(s) and email address. If it's not already the active tab, click on the Update Profile tab. Make any necessary changes to your phone number(s) or email address and then click Save. If you do not wish to save your changes, click Cancel. If you need to modify your First Name, Last Name, or Participant ID, you will need to contact your Coach. Use this functionality to change the password you use to login to the Virtual Goal Coach system. Click on the Change Password tab. Enter your old password into the "Current Password" field. Enter your new password into the "New Password" field and the "Confirm Password" field. Click Save to commit your password change. If you do not wish to save your changes, click Cancel. 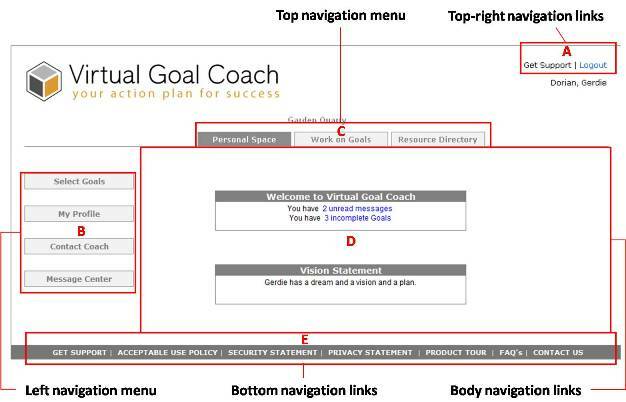 Use this functionality to enter and edit your Vision Statement which is displayed on the Personal Space screen when you login to Virtual Goal Coach. Click on the Vision Statement tab. Type your vision statement into the large text area. You may use the buttons at the top of the text area to spell check (ABC with checkmark), add markup (Bold, Italic, Underline), change alignment (Left, Right, Center, etc. ), add bulleted or numbered lists, etc. Once you have finished entering your vision statement, click Save. If you do not wish to save your changes, click Cancel. 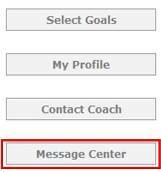 The Contact Coach section of the system allows you to quickly and easily send your coach a message. 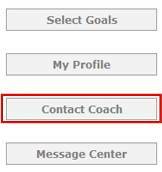 Click on Contact Coach link on the left navigation menu of Personal Space. Type your message into the large text area. You may use the buttons at the top of the text area to spell check (ABC with checkmark), add markup (Bold, Italic, Underline), change alignment (Left, Right, Center, etc. ), add bulleted or numbered lists, etc. Once you have finished entering your message, click Send. If you do not wish to save your changes, click Cancel. Your coach will receive this message in his/her message center. If you need to review any messages you have sent, you can do so in the Message Center which will be discussed next, in Section 2.4. The Message Center is basically your mailbox for messages between you and your coach. You can send and receive messages from here, review old messages, and change your messaging preferences. Click on Message Center link on the left navigation menu of Personal Space. Inbox: Bubbling in this option displays all messages that were sent to you. Outbox: Bubbling in this option displays all messages that were sent from you (i.e., those that you sent to your coach). From: This column displays the name of the person who send the message to you (when viewing the Inbox). If you're viewing your Outbox, it will display your name, since you are the sender. Subject: This is the title or name of the message. This is filled in for the sender when he/she creates the message based on where he/she was in the system when writing the message (e.g., If you clicked New Message from this screen, the subject would be "New message from participant" but if you entered it while viewing a particular goal, the message subject would be the name of the goal). Date: This is the date that the message was sent. Reply: Click Reply to write back to the sender of the message. A large text area will appear underneath the Reply and Close buttons where you can enter your new message. Once you've finished writing your message, click the Send button. Close: Click Close when you are done reading the message if you do not wish to reply. Show Read Messages: After you have "viewed" a message (by clicking the View button) it is considered "Read" and is hidden from your list of messages in your Inbox. If you would like to look at any "read" message again, check this box for Show Read Messages and all of your "read" messages will reappear. New Message: Click the New Message button to write a new message to your coach. A new window will open for you in which to enter your message. Messaging Preferences: Messaging preferences give you the option of choosing how you want to be notified when someone sends you a message. Receive Emails & Internal Messages: When someone sends you a message, you will receive an email (at the email address on your My Profile page) and the message will also be located in your Message Center. Receive Internal Messages Only (default): When someone sends you a message, it will be located in your Message Center, but you will not receive an email. Your Vision Statement is displayed on the Personal Space screen. 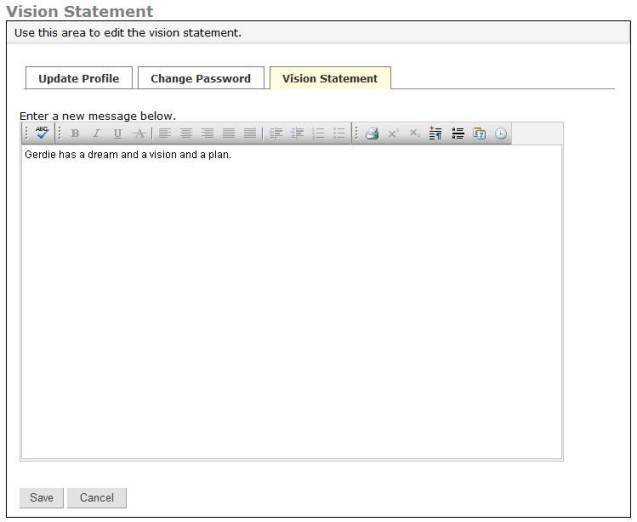 To enter or modify your Vision Statement, you will need to do so from the My Profile section of the system. This functionality is discussed in detail in Section 2.2c of this manual. Work on Goals allows you to document the progress you've made in working through your Steps and Goals. Select Work on Goals from the top navigation menu. Use this functionality to find resources (called Question Links or "QLinks") to complete your Steps and Goals. This is also where you will indicate steps that have been completed as well as message your Coach regarding specific Steps or Goals about which you have questions. Using the buttons and links available on this screen, you can view your Steps and QLinks as well as update their status. Goals: The names listed in the left-hand column are the goals. 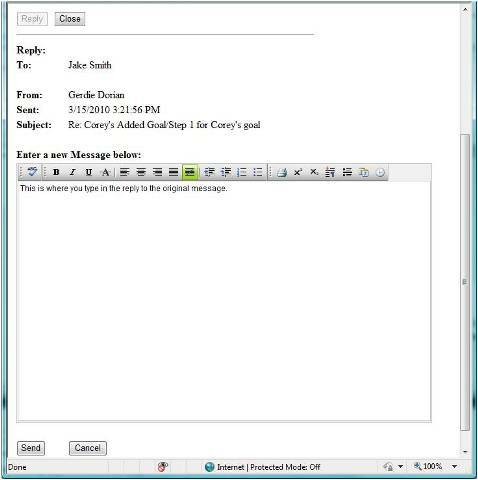 Message Icon: Clicking this envelope will open a New Message window and you will be able to send your Coach a message about this particular goal. Type your message into the large text area. You may use the buttons at the top of the text area to spell check (ABC with checkmark), add markup (Bold, Italic, Underline), change alignment (Left, Right, Center, etc. ), add bulleted or numbered lists, etc. Once you have finished entering your message, click Send. If you do not wish to save your changes, click Cancel. *Note: Additionally, if you use your mouse-pointer to hover over the message icon, a small flyout (or tooltip) will appear showing the number of new and sent messages relating to this goal. Expand Steps: Click the double down arrow icon to expand the steps for a particular goal. This will be looked at in detail soon. Incomplete Steps indicator: The icon shown in the image above indicates that there are incomplete steps for this goal. Once all steps have been completed, you will see this indicator change into a green check mark, which will be discussed soon. Steps: The names listed in the white section of the left-hand column are the steps (each step has a curved arrow to the left of it). Step Status: Use this dropdown to indicate the "status" of a particular step. Your choices are "Pending" or "Complete." "Pending" means you are still working on (or have not started) a step, while "Complete" means you have completed that step. Collapse Steps: After expanding a step in the previous steps (using the double down arrow), the icon will change to a double up arrow. Clicking this icon will collapse/hide the steps until you expand them again. 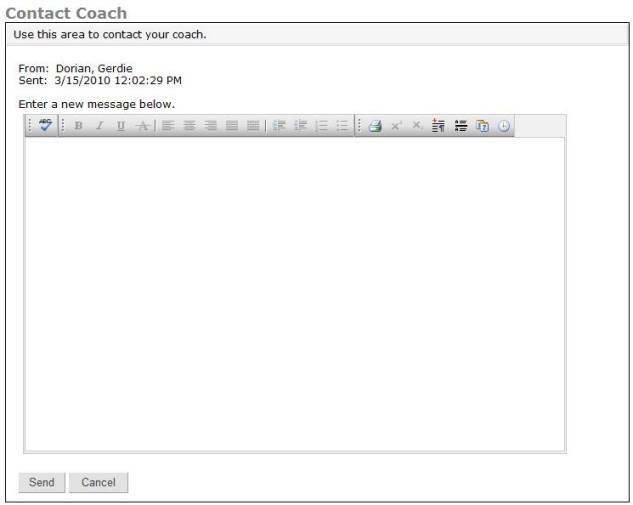 Message Icon: Clicking this envelope will open a New Message window and you will be able to send your Coach a message about this particular step. Type your message into the large text area. Once you have finished entering your message, click Send. If you do not wish to save your changes, click Cancel. *Note: Additionally, if you use your mouse-pointer to hover over the message icon, a small flyout (or tooltip) will appear showing the number of new and sent messages relating to this step. Expand Question Links: Click the double down arrow icon to expand the Question Links for a particular step. This will be looked at in detail soon. Incomplete Step indicator: The icon shown in the image above indicates that this step is incomplete. Once this step has been completed, and you've changed its status to "Complete," you will see this indicator change into a green check mark. Question Link: The names listed just below each step and aligned furthest to the left are the Question Links. Each question link has resources associated with it (discussed in item 3 below). The question links and its associated resources appear in alternating white and gray boxes. For example, in the image shown above, there are two question links displayed: 1) "Do my skills and experience fit my job or career choice?" 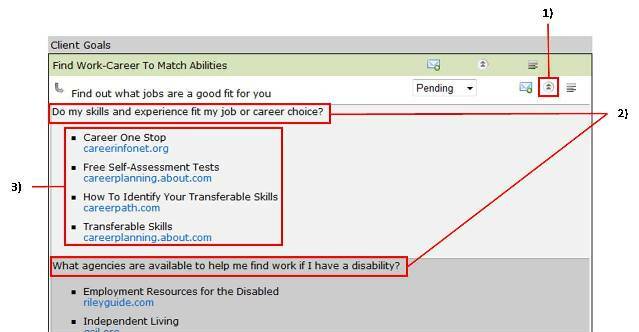 and 2) "What agencies are available to help me find work if I have a disability?" Resources: The items listed under each question links are the names of Resources (each resource has a small square to the left of it). Each resource has a link below it (they are blue) that will take you to a website or article when clicked. The websites/articles will have information you can use in completing your steps. These links will open in a new tab or new window; you will not be logged out of Virtual Goal Coach. 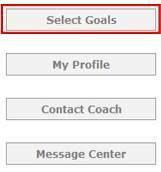 To return to Virtual Goal Coach, all you do is close the tab or window that opened when you clicked the link. Now that you understand the link options available at the Question Link level, let's look at how to update the status of Steps and Goals. Once you've reviewed the Question Links for a particular Step, and you feel the step is complete, you'll want to update its status. Click the expand steps icon to view the steps for the goal you're working on.
. The Goal Completion Question is discussed next, in Section 3.1b. Use this functionality to indicate whether a Goal has been met after all steps have been completed. Bubble in the appropriate answer to the Goal Completion Question of "Yes" or "No." If you have completed all of the Steps for a Goal and answer "No" to the Goal Completion Question, then your coach knows that you need further steps in order to reach your goal. If, however, you mark "Yes" then your coach knows the Steps provided were adequate and your goal has been attained. The Resource Directory is a place where you can find a list of helpful agencies and resources to help you in your journey to achieving your goals. These resources can be filtered and sorted and even printed out for reference. Select Resource Directory from the top navigation menu. You will be presented with a directory of all resources made available to you by your coach. Alphabet Rolodex Tabs: Use the alphabet rolodex tabs to filter the list of Agencies based on the agencies' names. 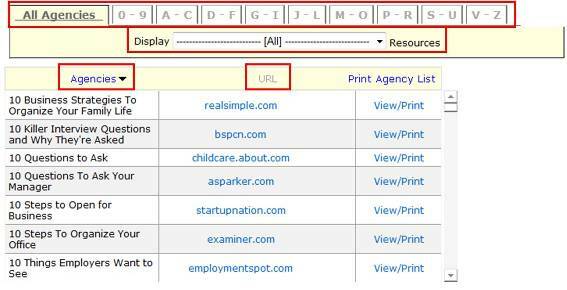 For example, clicking on the 'A-C' tab would display only those agencies with names beginning with the letter A, B, or C.
Category Filter: Use this dropdown filter to find agencies of a specific category. For example, you could select the category of "Benefits Assistance" and you will be provided only with agencies that provide Benefits Assistance. "Agencies" column: This column displays the names of the agencies. Clicking on the actual word "Agencies" (the column header) will sort the list of agencies by name A-Z and if you click it a second time, it will sort the opposite way, Z-A. "URL" column: This column displays the web address of the agency. Click the link to be taken directly to the agency's website. Once you've filtered/sorted for the resource(s) you're interested in, you can print a single resource or the entire list of resources currently displayed on your screen based on your filtering/sorting selections. Print Agency List: Click Print Agency List to print the entire list of agencies that are currently displayed on your screen based on your filter and sort selections. View/Print: To print a single agency, click the View/Print link located at the end of the agency's row.